Because I don't read weather forecasts, spring came today and I was not ready. "Ready" is a relative term; there is little I do differently from one season to the next except tell my son he is not dressed properly. We actually had that fight on the front step this morning. He tossed on his jacket (it's actually an old one of mine - it's a pretty cool long brown heavy cotton man's coat with big patch pockets on the front. Sounds hideous - it's not. The only problem is that we call it his drug dealer coat because when he wears it, he looks like a drug dealer. If drug dealers have blond brush cuts, skateboard shoes, a hoodie and wear their mother's hand-me-down decades old coats) and headed out the door. I yelled at him for not having a sweater on underneath - it's not a very warm coat. Before I could say another word, he realized it was spring and tossed the coat on the ground and took off in just a t-shirt. It's okay. I got even. I made a dentist appointment for him today at 4:30 that he doesn't know about. I had to go work out today, as I am deep in preparations for my dancing debut. Well, I haven't actually danced yet, but I am huffing and puffing and sweating and swearing with my boxing trainer. It is not attractive. What is attractive is the car I'm driving this week. 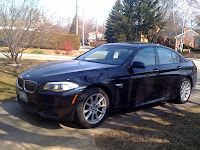 I have a new BMW 528i. It is smooooooth. Four cylinder, great on gas, and is just a dream to drive. I actually want it. I don't say that often - I happily hand back press cars and carry on. This one I would like to keep. Ari is in charge of all the toggles and switches when I get a new press car. He instantly figures everything out, and laughs at me because I'm scared to touch anything. In many of the new cars, I feel like I'm staring at a NASA dashboard for launching things into space. I get in, set up my phone, get the mirrors and seating straightened out, then wait until I get home for Ari to sort out the rest. Well, I came out into this spring afternoon after working out and decided it might be nice to open the sunroof. And so I promptly squinted up at all the buttons on the roof and pushed one. Instantly, the dashboard told me that I had placed an SOS call. I pushed the button again. This does not cancel an SOS call. Neither does pressing the button 15 more times. As I sat there dialing dials and pushing buttons (I did change the radio station), a man's voice filled the cockpit. I mean the car. "Hello, this BMW emergency. We have detected a terrified caller and have sent out a search team, rescue dogs, alerted the military and brought all traffic to a halt. How can I help you?" He didn't actually say that middle part, but he might as well have. "Uhm, I was trying to open the sunroof and hit this button by mistake. I'm really sorry," I told him. "No problem ma'am. I'll cancel the call," he replied calmly. I thought about asking him if he knew how to open the sunroof, but decided that would be pushing my luck. Then I got to thinking that if I had been kidnapped, and somehow managed to punch the SOS button, all a kidnapper would have to say was, "we were trying to open the sunroof" and I would remain kidnapped. I don't think this is truly an 'SOS' service (though that is what it is called on the little button) as much as it is a 'do you know how many stupid people hit this button on the first warm day of the year?' service. I carefully made my way home, scared to touch any more buttons. Because of that, I had to listen to Michael Buble all the way. I sympathize on the Buble thing... not my cup of tea. On the subject of press cars, when at a driving event, do you dread being paired with some wonk who has to hook up his iPod to the sound system so everyone can listen to his (or her) rare, bootleg tapes of Lady Gaga covering Thom Yorke's Radiohead when she was riding on her private subway car? In her freezer, same place as my snow. You should have a cup of tea with my wife. She likes to click her computer like you did the SOS key. When she clicks it twice and it doesn't immediately open she just keeps clicking away. Thirty minutes later she has 80 versions of Internet Explorer (yes... she refuses to change to Google Chrome) running and her computer crashes because it's out of memory. Then, of course, it's the frickin' computer's fault. Oh... and while you're sipping tea Ari should meet my youngest daughter Courtney. She dresses similarly, especially when going up to work at the barn. But ooooohhhhh.... she can dance. I'm assuming I just missed the news about Niagara Falls seceding the union and joining Pakistan. "naGra ystandti" doesn't really trip off the tongue but will, I suppose, have to do. Ozzie...was THAT what you were playing in that GTI we were driving? We have no snow. And I carefully angled that pic so you can't see the 911 parked right in front of it, and my contractors trashed minivan parked behind it. I believe in hitting all the little buttons on my computer until they obey. I drive my sons insane. Too bad about not learning how to use the CD player..woulda loaned you my Cars Greatest Hits LP. Hope your car doesn't have an ejector seat button. Please... that was Yoko Ono screaming Pink Floyd's greatest hits - from the Syd Barratt days. I know you don't claim to be a gearhead, but I can't say as I've heard of a 4 cylinder 528i....that motor is a 6 (have one in my 328i). Fun writing, think you have the same attitude I do when it comes to kids! Hey Lorraine, I was taking my 328xi out for a test drive when I noticed the sos button. I asked the sales person what it was? She didn't known so I pushed it. I found myself in the same position as you.After I explained myself,she hoped I liked the car and would buy it and I did! The Germans know how to build a great car. What is happening in the automotive universe? A BMW 528 powered by a 2.0 l engine? 528 is supposed to mean "5 series powered by a 2.8 l engine," not "5 series powered by a 2.0 l engine pimped out to produce the same power as a 2.8 l engine." Lexus started all this with the hybrid RX330. They called it the RX400 because with all the electric doo-dads it produced the same power as the 4.0 l V8. So it makes people think they're driving a V8 but getting V6 mileage. Oh ya... I guess the marketing departments are right... we ARE all stupid.